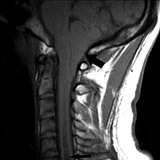 Syringomyelia, often referred to as SM, is a chronic disorder involving the spinal cord. The condition occurs when cerebrospinal fluid (normally found outside of the spinal cord and brain) enters the interior of the spinal cord, forming a cavity known as a syrinx. 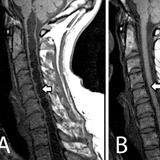 This syrinx often expands and elongates over time, destroying the center of the spinal cord. As the nerve fibers inside the spinal cord are damaged, a wide variety of symptoms can occur, depending upon the size and location of the syrinx. There are two major types of SM. In most cases it is related to a congenital malformation involving the hindbrain (cerebellum) called a Chiari I malformation. This malformation occurs during fetal development and is characterized by downward displacement of the lower part of the brain (cerebellar tonsils) beneath the foramen magnum, into the cervical spinal canal. This displacement blocks the normal flow of cerebrospinal fluid. 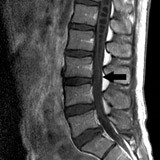 When normal flow is obstructed, a syrinx can form in the spinal cord. 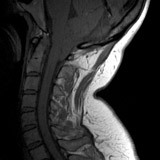 Not all patients with Chiari malformations will develop a syrinx, however. SM can also occur as a complication of trauma, meningitis, tumor, arachnoiditis, or a tethered spinal cord. In these cases the syrinx forms in the section of the spinal cord damaged by these conditions. As more people are surviving spinal cord injuries, more cases of post-traumatic SM are being diagnosed as the syrinx can form years after the trauma. Scoliosis may be the only symptom in children. 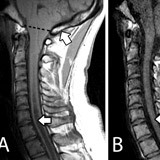 Often people with scoliosis undergo spinal MR imaging because of an atypical left-sided thoracic curve. Many individuals suffer from chronic pain and some will develop neuropathic pain syndromes. This type of pain is difficult to treat. A large percentage of people have headaches which can be severe. 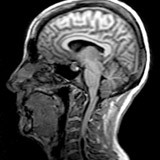 The first step after diagnosis is finding a neurosurgeon who is experienced in the treatment of SM. Finding a specialist is highly recommended. Surgery is the only viable treatment for SM, but not all patients will advance to the stage where surgery is needed. Evaluation of the condition is often difficult because SM can remain stationary for long periods of time, and in some cases progress rapidly. Treatment is aimed at restoring the normal flow of spinal fluid. 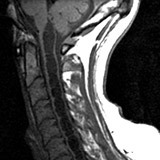 In persons with Chiari and SM, a procedure known as a posterior fossa decompression may be recommended. This procedure allows the cerebellar tonsils to move into a normal position, restoring the normal flow. After this procedure the syrinx will often reduce or resolve on its own. This can take months and may never completely collapse the syrinx. Some patients may require repeat surgeries. The most important consideration in deciding to undergo surgery is the severity of symptoms and overall quality of life issues. In syrinxes associated with other causes, the surgical treatment is also aimed at restoring normal physiology and flow of spinal fluid. This might involve a bony spinal decompression, removing a tumor or scar tissue. In cases of tethered spinal cord, a surgical procedure is used to release the tension on the cord, allowing it to return to its normal position. In rare cases, a shunting procedure may be necessary. This involves inserting a tiny tube into the syrinx which drains to a cavity outside of the spinal column. Shunting procedures are associated with certain risks and shunts frequently become clogged or dislodged. Repeated surgeries may be necessary.